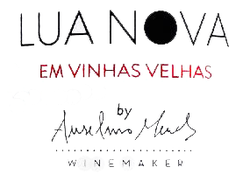 Lua Nova translates as “new moon in old vines”, which captures the modern, organic approach of this project of highly regarded winemaker Anselmo Mendes. Enchanted by the vineyards of old Quinta dos Friars - the age of the almost century-old vineyards and its great diversity, Anselmo was driven by the vision to make wines that are a true expression of the land where they were born. The wine results from an initiative to produce a wine from very old vines not divided into lots and with a mixture of 23 varieties. Full-bodied yet with elegance and personality, Lua Nova successfully depicts the essence and excellence of the old vineyards of the Douro.